The following four newspaper articles, or excerpts of articles, are from June, October, and November 1938, respectively. 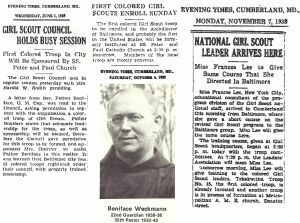 The articles provide some background on the formation of the first "colored" Girl Scout troop in Cumberland, which was initiated by Father Boniface Weckmann. Not mentioned in these articles is Romaine Franklin, who is featured elsewhere on this website, and who played a lead role in the formation of the troop. As a footnote, the first "colored" Girl Scout troop in Cumberland was named Tekakwitha Troop, No. 15. Kateri Tekakwitha (1656-1680) was a Mohawk-Algonquian woman from New York State. She was a convert to Catholicism and was in 1980 beatified by the Roman Catholic Church. A website sponsored by the Blessed Kateri Tekakwitha Conservation Center notes Tekakwitha is regarded by the Catholic Church as the "patroness of ecology, nature, and the environment." According to an official website of Girl Scouts of the USA (GSUSA), the first troop for African American girls was formed in 1917, and by the 1950s a national effort was undertaken to desegregate all Girl Scout troops. First Colored Troop In City Will Be Sponsored By SS. Peter and Paul Church. The Girl Scout Council met in regular session yesterday with Mrs. Harold Smith presiding. A letter from Rev. Father Boniface, O.M. Cap., was read to the Council, asking permission to register with the organization a colored troop of Girl Scouts. Father Boniface states that adequate leadership for the troop, as well as sponsorship will be assured, therefore the Council gave permission for this troop to be formed and appointed Mrs. Doerner to assist Father Boniface in this matter. It was learned that Baltimore city has 13 colored troops registered under their council, with properly trained leadership. The first colored Girl Scout troop to be enrolled in the Archdiocese of Baltimore and probably the first in the United States, will be formally instituted at SS. Peter and Paul Catholic Church at 2:30 p.m. tomorrow. Members of the local troop are mostly converts. Tekakwitha Troop No. 15 of the Cumberland Girl Scouts will hold its first investiture ceremony at 2:30 p.m. today. The preliminary investiture will take place in the cafeteria of the school and will be completed in SS. Peter and Paul's Church, followed by Benediction of the Most Blessed Sacrament. Rev. Father Boniface, O.M. Cap., moderator of Girl Scouting in the parish, will officiate at the investiture, and Mrs. Wyand F. Doerner and Miss Catherine Lippold will assist. The children’s choir will sing. After the investiture, the Scouts will present a program for their friends in the cafeteria. Invited to the investiture are the Cumberland Girl Scout Council, Ursuline Alumnae Association and the troop, the troop committee and leaders and members of the congregation of the Metropolitan A.M.E. Church where a Girl Scout troop is in the process of formation. The leaders of Tekakwitha troop are Mrs. Jesse Cook, Mrs. Herman Washington and Mrs. Lewine Weaver, and the troop is sponsored by the Ursuline Alumnae Association. Besides the leaders, eight girls will be invested. The troop has 10 members, and is the first for colored girls in the Archdiocese of Baltimore. Miss Frances Lee, New York City educational consultant of the program division of the Girl Scout national staff, arrived in Cumberland this morning from Baltimore, where she gave a short course on the revised Girl Scout program to the Baltimore group. Miss Lee will give the same course here. The training course, given at Girl Scout headquarters, began at 2:30 p.m. today with the troop committees. At 7:30 p.m. the Leaders' Association will meet with Miss Lee. Tomorrow morning, Miss Lee will give training to the colored Girl Scout leaders. Tekawitha Troop No. 15, the first colored troop, is already invested and another troop is in the process of formation at Metropolitan A.M.E. church, Decatur street. Photograph of Father Boniface Weckmann from "Als ich in Cumberland war... Capuchin Franciscan memories of 100 years in Cumberland, 1875-1975," by Blaine Burkey, Capuchin Priest, 1975. Father Boniface served as the 35th Pastor at St. Peter and Paul's Church in Cumberland from 1932 to 1942.